Mayan Civilisation extended over some three thousand years during which it flourished in the region of Mesoamerica. However, their most glorious period was the so-called Classic Period between 250AD and 900AD during which they made a lot of advancements in almost all the domains of life. This also included art and during the Classic Period, Mayan art and architecture developed to its zenith. Important elements of art, other than remarkable architecture, included stone sculpture, wood carving, stucco modelling, and others. Architecture was a particularly noteworthy feature of Mayan art. Some of the most important examples of the remarkable Mayan architecture included ceremonial platforms, courtyards and palaces, great plazas, ball courts, and most importantly, the pyramids and temples. Many of these buildings attract millions of tourists from all over the world every year. The walls of temples and pyramids were also decorated with Mayan art in the form of mural and stucco paintings. Mayans attained extreme efficiently in Mayan art of stone sculpture during the Classic Period. There were multiple categories of stone sculpture created by the Mayans during this period. For instance, they made “stelas” which were large stone slabs covered with carvings and inscriptions. Most of these stone slabs also depict the rulers disguised as gods. Other fine examples of Mayan art in the domain of stone sculptures include lintels spanning doorways, round or rectangular altars which had elaborate carvings and inscriptions, zoomorphs which were large boulders sculpted to resemble living beings, and monumental stairs. Wood carving was a very common form of Mayan art during the Classic Period, although not much survived because the Spanish colonial authorities destroyed it considering it idolatry. Important works of classic wood carvings such as intricately worked lintels were discovered in the Tikal pyramid sanctuaries. Another important example is the “war serpent” on Tikal wood reliefs which depict a king on his seat with a protector figure behind him. There are also various other noteworthy examples of Mayan art in the domain of wood carving, including a human impersonator of the jaguar god of terrestrial fire, depiction of an obese king in jaguar dress, and a victorious king dressed as an ancestral death god. The Mayans, during their Classic Period, reached the excellence in the Mayan art of stucco modelling. Ever since the Late Pre-Classic times, it was common to cover the floors and walls of the town centres with stucco plaster which actually became a precursor of stucco modelling. Large mask panels containing plastered heads of the deities were often hung with the sloping walls of the temple platforms. One of the most famous examples of Mayan art in the domain of stucco modelling is the stucco portrait of king Pakal at Palenque. The quality of these stucco portraits was equal to that of Roman ancestral portraits. The Mayans had a fully developed writing system as well as their own number system. Their writing system had over 1000 distinct characters or hieroglyphs and was a mixture of syllabic signs and logograms. Using bark paper and leather leaves and binding them with adhesive stucco layer, the Mayans had developed the art of bookmaking as well. These books were protected by jaguar skin covers or wooden boards. In addition to the codical glyphs, the Mayans also had a cursive script of dynamic nature often found on wall paintings. Ceramics had a special place in Mayan art since they were of special utility to the nobility and it was common to buy hair-looms made of ceramic with the deceased nobles. Special workshops were established for the manufacture of ceramic objects and different styles were prevalent throughout the Mayan kingdoms. These styles included Chama style, Holmul style and the Ik style. 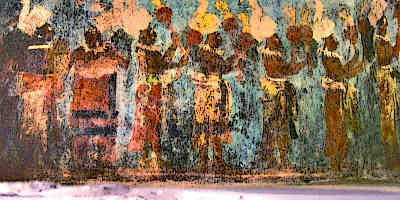 Paint was delicately applied to the wet clay surfaces, known as the Teotihuacan fresco technique. Other types of ceramic art included incense burners and hand or mold-made figurines which could sometimes be used as ocarinas. The Mayans made remarkable use of precious stones of a variety of types to create different kinds of objects such as ear spools, jade, pendants, and even masks. A famous example of this kind of Mayan art is the death mask of Palenque king Pakal which is covered with irregularly shaped jade plaques and contains eyes made from mother-of-pearl and obsidian. Jade disks were also used to make certain cylindrical disks found at Tikal. Flint, shell, and bone are among the sculpted and engraved materials frequently found in caches and burials. Another common practice was to decorate human and animal bones with incised symbols and scenes. Bones with this kind of decoration have been found in the royal burial at Tikal Temple I.
Mayans also made impressive advancements in the domain of applied art, particularly textiles. Although cotton textiles from the Classic Period have not survived, Mayan art provides important information about them, including their social function. Cotton textiles were used for a variety of purposes such as wrappings, curtains, canopies, and general garments. The use of textiles also varied depending on the social standing of the individuals. Animal headdresses and turbans were worn by both men and women, particularly during ceremonies and festivals. On ceremonial occasions, it was also common to paint the body with different colourful patterns. Body patterns could also be of a permanent nature according to social status and professions. Tattooing the face along with filling and incrustation of teeth were also included in Mayan body art. Mayan civilisation was the most impressive and dominant civilisation of the Mesoamerican region. It particularly made impressive artistic, social, and architectural advancements during the Classic Period between 250AD and 900AD. Mayans temples and pyramids are the foremost examples of impressive Mayan architecture. They also developed high quality art in the domains of stone sculpting, wood carving, and stucco modelling. Most of the Mayan art form the Classic Period was lost due to warfare and humid weather but some surviving artifacts provide important insight into the techniques and purposes of Mayan art.